1) Loose, Bulk, Organic, Fair Trade Darjeeling Tea - A mouthful, yes? Well, that's the type of tea I'd been looking for--I thought it would be quality, ethical, and environmentally-friendly. Because I am trying; we do need to try. I had just settled on the next best thing when I stumbled into a little shop in Prescott on a street just off the Square. It's called Nectar Apothecary, and they sell essential oils, some remedies, and bulk spices and tea. I got my tea in a little plastic bag this time, but in the future I'd like to bring my own glass container and ask them to fill that for me instead. 2) Tarte Tarteist Creamy Matte Lip Paint in Hangry/Berry - This is just a sample size; I got it because it was from Tarte, then became disappointed when I saw how dark it was. Given that I have dark, dark brown eyes, I usually avoid dark lip colors because I feel like they make me look too dark (side note: like in Once Upon a Time, they give Regina dark lipstick when she's being more evil and pinker lipstick when she's trying to be good). 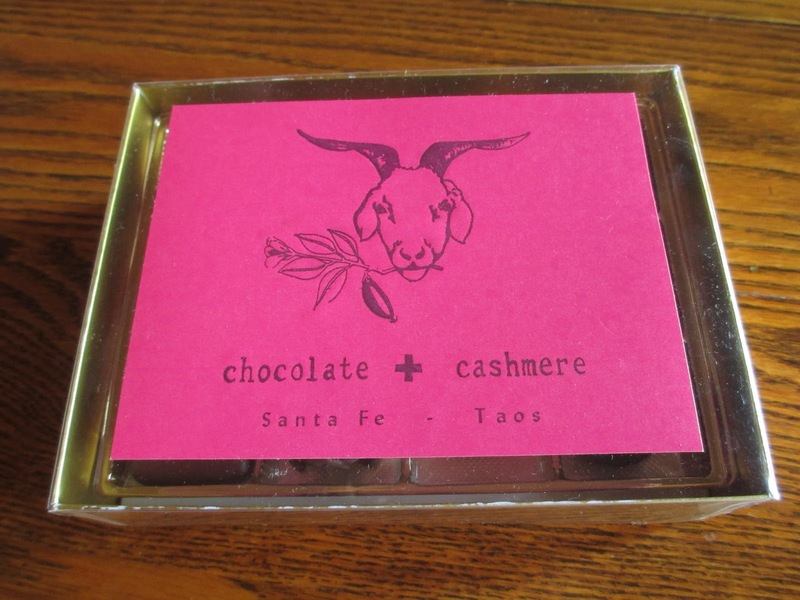 But it's actually such a nice product that the color is okay; I tried it out at the Santa Fe Opera because I thought it might make me feel formal rather than dark. Even though it's one of those liquids that goes on matte, it doesn't feel drying at all. And it fades away well, especially considering that it's so dark. As it fades (unattended) it just becomes more pink. I wasn't at all interested in these lip paints before, but now that I've tried it I would consider buying it (though, yes, I would choose a different color). 3) Carved Wooden Animals - Just outside of Santa Fe is a place called El Rancho de las Golondrinas (Ranch of the Swallows). It's, well, an old ranch with old buildings, fields, and things and helpful volunteers dressed period style to tell you all about the location and the setting. Very nice for a visit. They also happen to carry a couple of great items in their gift shop. The first time I went there, oh, about twelve years ago, I bought a little hand-carved wooden dog. When I've gone back since then, I try and get more of these beasties. A sheep, a fox, a little deer or something, a donkey, a couple of rabbits. This time I added to my collection with the duck and the bull on the left. 4) Carved Leaf Pendant - If you know Santa Fe, you know that outside the Palace of the Governors (which is a museum right on the Plaza), different Native American artists set out their jewelry to sell. So while I was there, I strolled by, looking at everyone's work until I found the thing that called to me. There are some simpler or "more expected" things for sale and also some very beautiful work--but we have some of this type of jewelry in Arizona, too. (There's a lookout point near Flagstaff, for instance, where the artists put out their tables.) So I had to just get what I felt like I would only find there and what I really wanted to get. I considered a necklace with alternating beads of turquoise and silver. But what I came away with was this leaf from Lloyd Garcia. 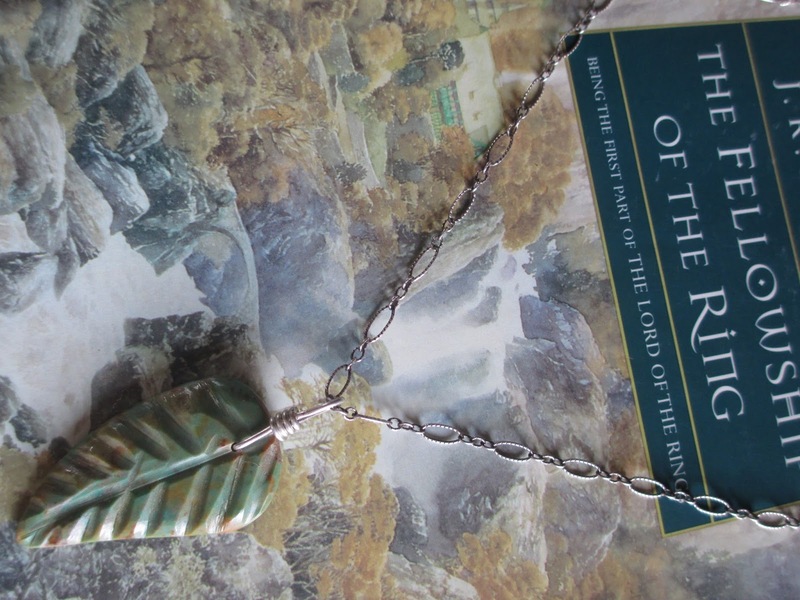 I do love the leaves, and I suppose that with this one and my shed antler leaf pendant, I'm getting a collection of them. The color and design were very me. Rather than buy a new chain, I just paired it with one I already had. 5) Oaxacan Alligator - I didn't think I would find any Oaxacan painted animals for my collection in Santa Fe, but there were a few at two stores that I saw. This alligator has plenty of detail, and it's a nice size compared with my other ones. If you haven't seen then before, I collect only the free ones. And they're really starting to look great together now that there are so many. 6) Global Girlfriend Scarf - More green. This scarf is not from Santa Fe; it's from the Desert Botanical Garden's gift shop (in Phoenix). It's silk and cotton and and made fair trade by women, hence the name--you're helping out your "global girlfriends" by purchasing. Besides the color, I just love the finish of the materials. The main part has more of the raw look of linen and the ends have a nice shine to them. 7) Zucchini in the Morning - Last month I mentioned that I was throwing the squash blossoms into omelets. Well, now that the plants are giving off a good amount of zucchini (and there are only two of them this year), I've been trying to eat zucchini more often. So sometimes for breakfast, I'll just chop up a zucchini and put it in a pan with some oil, salt, pepper, a pretend amount of garlic, and a small dash of oregano (also from the garden). While that's sautéing, make an egg and toast some bread with butter--and there you go. The difference in taste between these and the (organic) ones from the store is amazing. As Barbara Kingsolver said, no wonder we don't want to eat out vegetables when they have no flavor. 8) Chelsea & Violet White Dress/Whatever-It-Is - It's sort of in the shape of an Empire-style dress (think Jane Austen era). But it only buttons down to the (high) waist. There is lace on top and the rest is this sheer material. 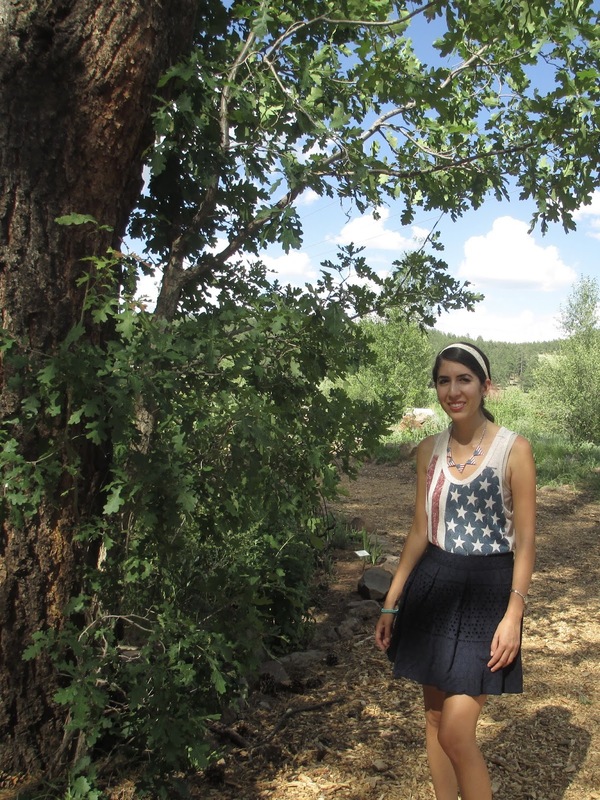 I loved wearing it in Santa Fe because I put on very practical gray shorts, green tank top, and Abeo shoes but then threw on this drapey, pretty thing that would flow behind me slightly when I walked. (Remember, I like long coats, so this is basically the same effect here.) It's the same outfit I had on for that picture outside of Chocolate + Cashmere that I included with my review on Friday. 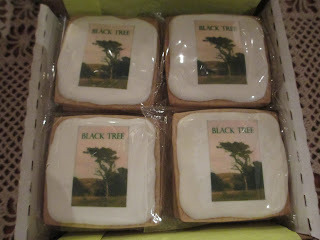 9) Getting to Unbox my Book & its Merch - And July, of course, is the month when my book, Black Tree, came out. I was so nervous to open the box that had my proof copy, but when my two boxes came with some additional copies, my nervousness turned to excitement. And now I also have new business cards, bookmarks, flyers, stickers, and matching address labels (by the way, I'll extend this invitation to anyone who's read this far down: send me an email [my info is on the Contact page] if you'd like some of this merch and I'll send a couple to you). The last item? 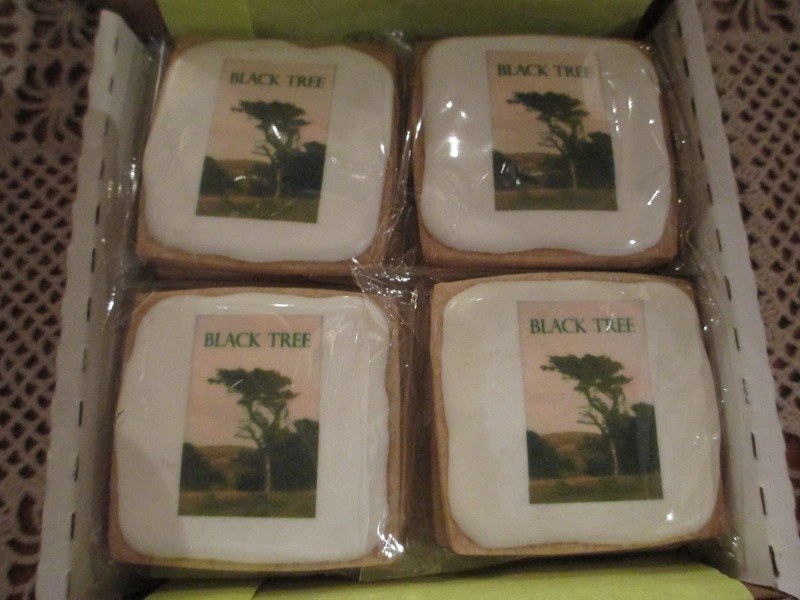 Cookies with my book cover. I'll get you some more pictures of those later, too. 10) Minimal Makeup - Lastly, we go back to image. Minimal makeup, for me, basically just means not wearing eyeshadow and only wearing eyeliner on the outer half of my bottom lash. Maybe because I've been too lazy, maybe because it's summer, maybe because I've been more into the natural look, I just haven't been going for the eyeshadow and the rest of the eyeliner lately. I do like eyeshadow, but I don't need or want it right now. Simple makeup and a cheery pink lip color has been my summer makeup look. In the time leading up to my trip to Santa Fe, I felt drawn to the Georgia O'Keefe Museum. This was, for a couple of reasons, strange. One: normally I associate Georgia O'Keefe with her close-up paintings of flowers and while they are nice, they were never among my absolute favorites. Two: I've been going to Santa Fe for a little while now and I've discovered that, while there are some good museums, I'm more interested in spending time in historical or sometimes outdoor places (which sometimes are museums, but distinct from buildings that simply hold exhibits). Three: no one else was interested in going. But we did have a free day planned (it was a short trip, so we kind of had to keep to a schedule most of the time). So after wandering around the Plaza for a bit, we split up and I went to the Georgia O'Keefe Museum and Kakawa Chocolate House (I'll post on that one later). And I think I discovered why I knew I was meant to go there. Going there was a reminder of the life that I can live. I'm not calling myself Georgia O'Keefe; I'm just saying that she was an inspired person and I would like to be, as well. I didn't watch the museum's film on her life because I didn't actually have too much free time, but I did read the text in the exhibit rooms. The paintings were grouped by theme, it seemed. Some of the abstract work was in the first room, where I was enthralled by Pond in the Woods. It's basically a circle, with more circles around it--all in blue, brown, and green. But it's absolutely fascinating and beautiful and amazing to see in person. The shapes and the shades and the sense of scenery and atmosphere; she really did capture the feeling of a pond in the woods. I don't usually care for abstract art, so I was surprised how much I connected with hers and how much it made sense to me. I was also quite fond of her Winter Tree. And her picture of Machu Picchu was quite nice, as well. It was just something entirely different to see her work in person--and also different because there weren't very many flowers. So I saw a lot of things that I, at least, had never seen before. Back to the theming. From what I gather, Georgia O'Keefe was a woman who saw beauty in the natural world and in the everyday world and wanted to capture the essence of that beauty in her work. She wanted to find new ways to record and new ways to translate and new ways to capture. And she was redefining the ways in which you could represent certain places--specifically the Southwest. She was doing exactly what I want to do with my writing: capturing the visuals of the Southwest unhindered by genre constraints. She painted her Southwest. This concept is very much evident not only in her landscapes but also in her skull paintings. And there were some photographs of her, as well. In her garden. Sorting through vegetables she'd grown. That sort of thing. Oh, that is a life lived. To appreciate the world around us and to take part in it and to care for it and to capture it in artistic representation. I walked away from the museum truly inspired. While I do enjoy culture, I don't know if I can say that I am particularly cultured. And yet perhaps that is the reason why I appreciate culture the way that I do. When certain things are new to me, I can either discover them on my own or have my own personal experience with them when I do finally get to experience them. My favorite example: I read Jane Eyre and started connecting with it well before I heard anyone talk about the book or its author or even knew that "Victorian novels" were their own group. I went to a few plays as a child--probably mostly smaller productions designed for families. But the big one that made me love the idea of plays was Pygmalion by the Southwest Shakespeare Company when I was in high school. Ever since then, I've just really enjoyed the few opportunities I've had to see live productions. I always wish I could see more. Now, I've been to Santa Fe a few times, but a recent trip I made there was the first time I was able to visit the Santa Fe Opera. We watched Don Giovanni, which I chose because the music is by Mozart and I tend to enjoy Mozart's music (and also because the language is Italian, which feels fairly familiar, which I thought would help make it easier to connect with the music and the story). And oh, my goodness, I had never experienced anything like this before. I was a little worried going into the first act: though I've always been used to classical music, opera singing is something different. Another level, if you will. I was worried I wouldn't be able to connect with it or that my attention would just wander. Sure, it can take a second to get used to, but it felt surprisingly natural, considering I've never really listened to much opera ("O Mio Babbino Caro" and songs like that don't count the way most classical artists sing them). The Santa Fe Opera is a half outdoor venue. That is, you enter from the outside, going up steps or through doorways to your section. The two levels of seats and the stage are covered by a ceiling and there are walls to the stage and to a little bit of the seating area but otherwise the sides are open--as is what would be the back wall or background to the stage. As the evening went on, there was some lighting off to the right in the distance, which rather added to the experience. Most people bring a wrap or a sweater because it usually cools off (the show starts at 8:30 and ends close to midnight), but we happened to go on a warm night so it never cooled off (I overheard people saying they had been going there for years and had never seem it so warm). Attire is varied and there is no dress code but most people dress up. I wore a plain black dress (just below the knee, A-line skirt), a frilly cameo necklace, and tan leather wedges. That outfit fit in perfectly. Comfortable shoes and clothing somewhere between business casual and evening wear. Not a single stiletto in sight but plenty of class. Since I live in an area where people don't really dress up, it was a delight to see everyone so nicely put together. And the opera itself. The lyrics are, of course, translated on tiny screens on the back of the chair in front of you. This helps immensely and I can't imagine watching without this. The lyrics being in Italian, I did catch a few words here and there--but not much. One thing I had wondered about an opera is how much of it looks like acting and how much just plays like singing. What kind of performance is it? Well, a little bit of both, I guess. There was no talking and yet it wasn't as if the actors were simply singing dialogue: they were performing one song after another (to live music, no less, which is a treat in itself). And they don't just stand there and sing; they move as the characters would move and they interact with one another and walk around the stage and all of that. So you are watching a plot unfold, but it's (in the case of this one, at least) a plot engrained in emotion. It's like the performers are brewing emotion on the stage and it's pouring out into the audience, a tangible tone that envelops you and holds your senses captive. They were a wonderful set of performers and of course Mozart's music was wonderful, as well. I'll say it again: I had never experienced anything like that. Pure emotion, pure art, pure performance--the opera. As this book grew and developed, I wanted it to be something Southwestern unhindered by genre constraints. Don't get me wrong, there are great Westerns out there and wonderful books about the West, border issues, questions of race and culture, and such. But I wanted to present my Southwest--the book that I wanted to write in the setting that I wanted to place it. And my book has nothing to do with these usual Western or Southwestern topics. It's like when you see a delicate and pretty painting of a cactus: it isn't in the usual Western style of art and yet it shares the visuals. It belongs to the same world but is its own genre. You can buy my book now at lulu.com/spotlight/deannaskaggs. It will also be available on Amazon and other sites in a few weeks, but I will be honest with you here and explain why I ask that you purchase straight from Lulu instead: I receive a much lower cut if you buy the book from other sites. There will also be hardcover and digital versions coming, if you prefer either of those; I will let you know as soon as those are available. 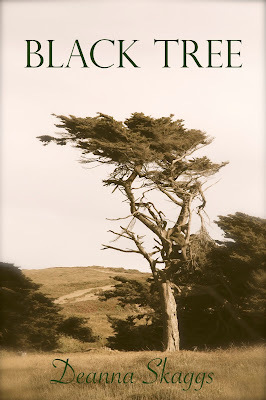 And remember, my author site is deanna-skaggs.com. Thank you so much for letting me share this debut with you, and I hope you're as excited as I am. 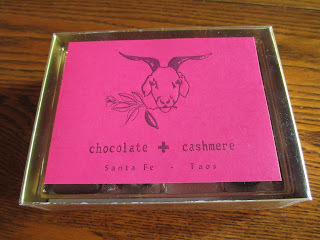 Don't worry, I will be continuing with chocolate reviews: I have a couple of suspects already in waiting. But it's something different for today: namely, a recipe. I'm not usually one to make up and give out recipes. I follow recipes that other people make or I just put together dishes that don't need recipes (like salmon with salt and pepper and rosemary). I don't really experiment in the kitchen. But is that a good thing? You see, I had been remembering how I had sometimes (just a couple of times) made hot chocolate just by mixing together cocoa powder and sugar. That's what the better mixes are made out of, anyway; everything else is just fillers (unless there are added flavors, like mint or rose, etc). So I decided to try it again--and I want to share my results. Use about 3/4 cup of whatever type of milk you drink. Heat it up in a saucepan. Stirring, sweeten with one teaspoon of sugar or honey--I don't notice much difference in flavor with the honey, so give that a try because honey's better, anyway. Two teaspoons of cocoa powder will give you a pretty standard proportion of chocolate, but I've started only using one teaspoon because I'm trying to make the cocoa powder last longer. And also because I've started adding a good sprinkling of cinnamon in, too, because cinnamon is healthy and it tastes nice. Now I've ended up with a nice, spiced, lightly sweet mixture for a quiet evening. You get the gist of it? Start with the milk, sugar, and cocoa powder and don't stop there. Do you like thicker chocolate? Add three teaspoons instead of just two. Do you love rose? Add some rose water. Try a bit of cream instead of marshmallows. Shave some chocolate into the warming milk. Whatever it is, don't feel like there is only one way to do it. And don't feel like hot chocolate has to come from a packet or a box or a bag or a tin. Mixing it yourself is simple and gives you better control of ingredients. You can use whatever cocoa powder you like--and if you avoid Hershey's and Nestle, you'll end up with much better quality hot chocolate than what all the standard mixes offer. I've been using a tin from Guittard (from World Market) because I really wanted to buy it since Guittard usually makes good products--but some of the recipes I use don't want Dutch process cocoa powder (which this is); so I can still use it in hot chocolate. Come to think of it, mixing up some batches and putting it in pretty jars with ribbons and such would make nice presents for birthdays and Christmas. Lots of possibilities. I literally could not remember adding this show to my Netflix queue and yet there it was. I couldn't even see what about it must have appealed to me and I was about to ignore it when I thought that I might as well try watching the first episode. Maybe it would be something mildly interesting to slowly watch whenever I wanted something meaningless to watch at the end of the day. And that's how the first episode was: it was entertaining, in a very meaningless way. The premise of the show is that earth is covered in nuclear radiation so the surviving people have been living in a space station for a hundred years, waiting for the day that they can return to the earth. A group of teens are sent down to the surface without warning or proper supplies. So they're all very excited to be on land for the first time, to be free for the first time--and that was kind of fun to watch, I guess. But then something happens at the very end of the episode that makes you realize that this isn't just a YA show about teens having fun: we learn that the ground is inhabited and the inhabitants are not friendly. From here, the show starts building up intensity. If I had known it would be this violent and bloody, I wouldn't have watched it--but it kept my attention so much that I couldn't stop. Lots of fights, lots of knives and some guns, lots of torture, and lots of emergency surgeries without the proper medical setting--and lots of blood. In the first season or two, it seems like everyone's face is always covered in blood. There are always high stakes of life and death. Season 1 has an obvious blend of Lord of the Flies and Lost with a touch of shows like Battlestar Galactica and a helping of Terra Nova. But it also felt unique and well formed, very complete in detail and focus. (However popular Lost was, it was a show that ultimately implied a lot more cohesion that it offered in the end.) By the coming of Season 2, the terrors build even more until they become almost nightmarish--which, while uncomfortable, is also an interesting angle. Season 3 is very different, less earthy and more sci-fi. Still high stakes, but less brutal at times--and it sounds odd, but I think the brutality is what makes this show itself (which is why things like "the cross" were some of the better moments in Season 3, because they felt more like what came before). There are also some politics and some philosophy, often to do with the concept of leadership. A lot of the attention goes to character motives. These characters are trying to do what they think will best protect those they care about--sometimes they choose well and sometimes they don't. Sometimes it seems that nothing they do goes well. So that's all interesting material to ponder. I couldn't tell what network had made this show. I couldn't even tell the target audience. Then I saw that it was by the CW, which is a little odd to me given that CW shows seem to be about people with dressed-up hair, makeup, and clothing, and usually everyone in this show looks like they haven't had a good bath in months. But it also makes sense: the CW targets teen and twenty-something audiences and up, right? That's about what this show does, too. Half the characters are teens but it isn't YA. It has more of a community approach to be YA--which reminds me that communities ("your people") are another big topic in this show. In the first episode, some of the acting seemed under par, but after that it was all fine--some good acting in there, in fact. Another random thing to note: this show had the cutest moment with a newborn baby that I've ever seen on film (with Octavia). It's hard to say how much I do or don't like this show. At first I thought I was just enjoying watching it for the suspense and then I would be done with it once the episodes were through. But now I find myself rewatching everything, and I still think about the characters throughout the day. So I may do another post later on, after I've finished the rewatch, with some more thoughts. After all, this is a very easy show to talk about: there is so much material, cultural and thematic, to ponder and analyze. I've been collecting some of my favorite quotes (there are so many very good quotes in this show) so that I can share them at that point. Sometimes people think I am quiet. Sometimes I am. But not really. I am a listener, that's all. When it is my space to speak, I can go on forever and without pause. But I always am willing and desiring first to hear what everyone else is saying. I can't think of what I want to say sometimes because I am too busy listening. Just because I listen doesn't mean I don't speak, or that I don't want to speak. Take school, for instance. It was hard to talk in front of the class in middle school because I was still trying to get comfortable in my own skin--so telling me to stand in front of the class and deliver a speech well was, essentially, torture. But I was improving enough in high school that by sophomore year, I realized that presentations (a much better word than speeches) could be fun. I could adopt a new identity when gave a presentation. My presentation partner and I dressed in costumes to deliver our project on Macbeth; I later used the same dress senior year when my group presented our retelling of Rapunzel. Dressing up in some way or form, even with just a subtle adjustment to a regular outfit, separated me from my hesitation and helped me to focus instead on the information I was delivering, on giving it atmosphere. And do you know what happened? By the time I was in college, I was almost enjoying presentations. By presentations, I mean the big ones that you have to plan for a long time--not the quick moments when you go up with your group for five minutes. I was nervous when I found out that I would have to give two big presentations for my food class (one for the whole class time with a partner and then one by myself for half the class time)--but I put a lot of thought into my individual presentation and I rather liked sharing my topic with everyone. That's the center of it all, isn't it? I like to say something when I speak--which certainly isn't to say that I don't like to talk nonsense, too, like everyone else. Nonsense being spending half hour discussing the best and worst lip colors and products, or naming off the worst car names, or whatever else. But that's filler talk, talk that you use when you're simply spending time with people you like, people you're comfortable with or see often. They won't call you quiet because they see you too often to think that. The people who wouldn't know are the people I don't want to waste words on: I don't want to make them listen to endless blabbing without meaning or purpose. I don't want to speak just for the sake of speaking. I want to speak because we have something to talk about together, because a conversation has come up that I have something to say about. After all, it's possible that I talk less around you because I like to hear you talk. Here we come back around to the listening. Everyone, whether you naturally speak more or less, benefits from knowing how to listen. This we hear mentioned often, and it is true. There is much to learn from what other people say, whether or not you agree with it, and there is much to learn from knowing when to speak and when to listen. Listening is much like reading, just as speaking is in some ways like writing. I can write because I read, and likewise in order to speak I must first listen. What was so nice this year was the way in which Fourth of July was not just one day but rather a whole weekend. And since I keep collecting flag shirts, I had just enough to wear one on each of the three days. This year I was able to just spend time in a couple of places around the area. Saturday was for Out of Africa, which I had been hoping to visit one of these days when the weather seemed a little cooler. It was the perfect day for it: there was some cloud coverage to keep the temperature down and there was even a light misting of sprinkles a couple of times. The animals looked like they were enjoying the weather, too. Tiger Splash had two tigers (I think Journey and Gabriel), one white and one orange. I think I had only seen the show with one tiger; two of them is another dynamic. They have to put in an extra effort to keep an eye on both of them and engage both of them at the right moments. One of the highlights was seeing them both in the water watching the toy above them, seeing who would get to have it. Oh, yes, and here is Chalet; she often does Tiger Splash on busy days because she does such great jumps into the water to get the toys. On Saturday she was enjoying a nice nap instead. The 3:00 show had the hyenas, though they don't go in with them anymore. As the keeper said to one of the hyenas while he was petting him, "We have a great relationship . . . through the fence." Still a great opportunity to see the hyenas and learn about them--they're one of my favorite animals at the park. Then, of course, there was Cypress, the grizzly bear. She was right next to the fence, so I had to get a picture with her. Then as soon as I walked away, so did she. Sunday was a Flagstaff day. Lunch at Criollo, which uses a lot of fresh and local ingredients and products. Afternoon at the Arboretum. Perfect weather, in the seventies with both clouds and sun and just a bit of breeze. Flagstaff is beautiful in summer. And the Arboretum always makes me want to grow more plants, herbs and teas and flowers. Their butterfly exhibit is open now and while it's smaller than the one at the Desert Botanical Garden in Phoenix, there are also less people, so you still get a chance to see lots of beautiful butterflies up close. I'd been thinking of Tempe Town Lake for the Fourth on Monday; as the day got closer, I thought it would have to be Prescott instead. But instead we ended up back in Flagstaff for the event at the Continental Country Club area. While the fireworks certainly aren't as numerous as those in Tempe, Flagstaff was all the same a very nice experience. Arriving in late afternoon, the weather was beautiful for sitting out on the lawn (the golf course, actually); we sat right by the water. The food vendors available were good (I probably spend most of my time walking back and forth to get lemonade, tacos, more lemonade, funnel cake, watermelon, ice cream, and churros). As it gets darker, more people start arriving, but still the crowds are nothing like Tempe; you actually have a little breathing space here. We were playing ring toss with glow sticks and trying out our 3D fireworks glasses while we waited for the actual fireworks to start. If you haven't tried those glasses yet, they're quite an experience. Very psychedelic. Every light gets reflections all around it so that even the street looks like a light show. The glow lights look amazing--we were giving ourselves headaches by trying to play ring toss with the glasses on. The fireworks look pretty cool with them, too; since this show was a little more bare, it was a good one to try one the glasses on. You still see the firework itself normal; it just has reflections of light and color framing it. I watched about half the time with the glasses and half without, on and off. In case you were wondering. Saturday's outfit: Guess shirt (from last year) and Charming Charlie necklace (also from last year). Sunday's outfit: Ross shirt (from last year) and Banana Republic skirt. Monday's outfit: shirt from the new clothing store on the first level of Bashford Courts in Prescott, leggings from Clothes Hound in Prescott (several months ago), and flag necklace from Michael's or Hobby Lobby (I think Michael's).